Just when you thought you have seen the ultimate gaming Notebook, ASUS pushes out another cooling beast that tops it’s brother. In 2016 the World’s first Liquid Cooled Beastly Gaming Notebook was announced which was also displayed at the rAge Expo in Johannesburg, the GX700. Towards the end of last year, the GX800 was announced and is available is South Africa February this year. But that set aside, what exactly makes the GX700 and 800 so incredible? The GX700 is like a Bugatti Veyron however the GX800 is like a Lamborghini Veneno to the tech industry. Easy on the eyes, and the Notebook perfectly hides the monster inside providing users with the optimal gaming experience. The GX700 as mentioned is the World’s first Liquid Cooled Gaming Notebook with the detachable ROG-exclusive Hydro Overclocking System cooling module. Powered by the 6th-generation Intel® mobile K-SKU (‘Skylake’) processor and NVIDIA® GeForce® GTX™ 980 graphics card to give users desktop-grade power at home and ultra-fast performance on the go. GX700 is also the world’s first real 4K UHD gaming laptop to feature NVIDIA G-SYNC™ for smooth, stunning visuals. One almost questions if there is any room for improvement, but being ASUS, they have outperformed expectations, once again. The big brother, GX800, joined the ASUS family during Q4 in 2016. The GX800 has two NVIDIA® GeForce® GTX 1080 graphics cards, running in SLI which pushes graphics to another level in a notebook. An advanced version of the Hydro Overclocking System liquid-cooling module. The 18-inch GX800 is the first gaming Notebook designed to deliver real 4K UHD gameplay. This behemoth Notebook also features NVIDIA G-SYNC™ technology and supports leading virtual-reality (VR) headsets for super-smooth and stutter-free VR gaming. In addition, it also features the Mechanical Tactile Advanced Gaming (MechTAG) keyboard with programmable ROG Aura RGB LED effects for individual keys. The mechanical keyboard is the thinnest keyboard with RGB LED and anti-ghost tech for 30 keys rollover. 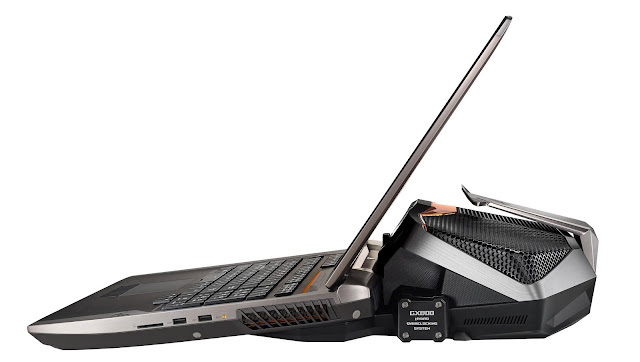 Both the GX700 and GX800 have a pump to circulate coolant around heat-generating components inside the Notebooks. The coolant is pumped and circulated around the processor and graphics card before it returns to the cooling module where two radiators help to dissipate heat. 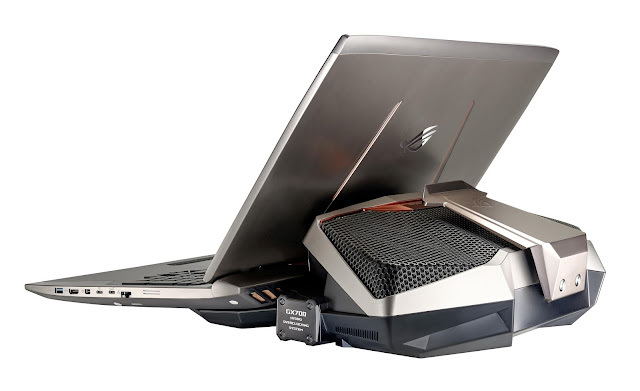 This ROG-patented connection between the cooling module and Notebook ensures that the liquid coolant flows smoothly between the two without leaking. The coolant provides corrosion protection for all internal components and materials, including aluminium, iron, steel, and copper alloys. The very low depletion rate of the organic-acid inhibitor removes the need for supplementary cavitation erosion protection additives, and reduces the maintenance downtime normally required for regular inhibitor tests and additive top-ups to maintain inhibitor concentration. The GX800 has separated thermal modules for both the CPU and 2x GPU with rear and side ventilation including the liquid cooling docking station. The Notebook also has an enlarged plug port diameter allowing for up to 70% more liquid increasing performance with a special seal for plug port to prevent leaking (Double O-Ring). This monster has a Duel Fan and Air outlet (four Air outlet) and a dedicated thermal plate for two GPU and CPU to increase thermal efficiency. The exclusive GameFirst IV is upgraded to more gamer-friendly features and an even more intuitive interface. GameFirst IV helps you prioritise game packets and allocates more bandwidth for games to give you the best online gaming experience. The Thermal has been upgraded drastically, improving the liquid cooling of the GX700, the GX800 performs even better without overheating. The GX800 uses a 7th Generation Intel CPU, uses less power and ensures higher performance. 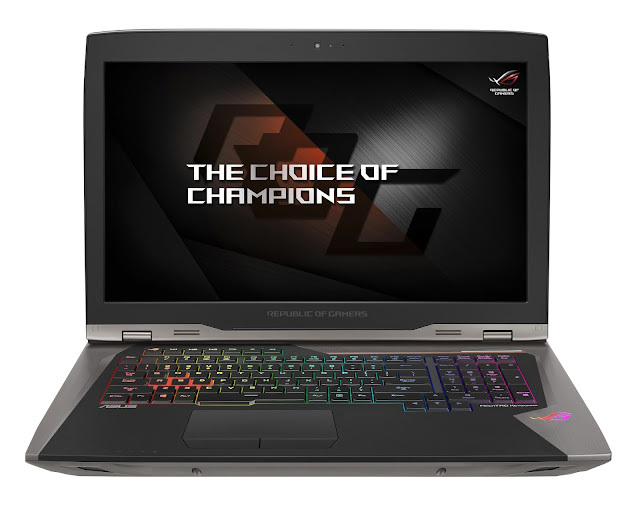 The Graphics of the GX800 runs a SLI which means the Notebook uses two graphics cards whereas the GX700 uses one graphics card. The below specifications may vary depending on specific type of unit. Checkout this amazing piece of technology from the house of ASUS - Republic of Gamers.